Iota hosts pop punk Idea Track and Citizen tonight. Citizen also played with local rock group Rome in a Day recently and should put on a good show tonight. The venue is also raffling off two tickets tonight to the "OPERATION HOMEFRONT" show at 9:30 club on December 2nd. The show will feature Citizen and Shinedown and is dedicated to supporting US military troops and their loved ones. which features Persian beats by DJ Dariush pumping out non-stop dancing in a unique atmosphere, surrounded by Iranian-American contemporary art. DJ Dariush is well known for his high-energy beats and began his career more than 15 years ago in Tehran. The Fridge DC is a new art gallery, performance space, and art school that offers full scholarships for children of low-income DC area residents. 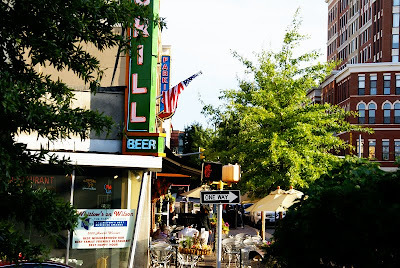 Real estate blog DCmud featured an excellent and accurate article on Clarendon today. Resident James Mitchell perfectly describes the variety of this Orange Line neighborhood, from the swaths of different types of residential housing available to the diverse nightlife. "I find myself nitpicking the commercial and residential aspects of the neighborhood; for every Cheesecake Factory customer, there’s another with a trusty Whitlow’s mug for Thursday nights. For every Apple Store employee, there’s an indie kid covering Death Cab for Cutie at Iota." Cheers to Paul for finding this article! 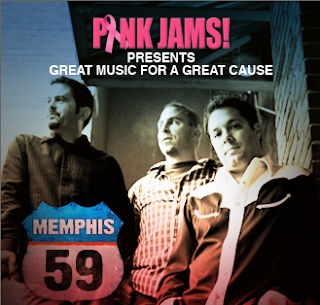 Pink Jams is charity concert fundraiser coming to the Clarendon Ballroom on November 18, 2009. Music will be provided by popular local musician Justin Trawick and Memphis 59. The event is in support for the two day Avon Walk for Breast Cancer on May 1-2, 2010. Organizer Christa Floresca and thousands of other men and woman will journey a total of 40 miles through our nation's capital to raise at least $10,000. Donate here or come out to the Ballroom next week to support this great cause! The Return of Dr. Dremo's? The DCist is reporting that the owners of the once beloved Dr. Dremo's may once again bring the venue back to Clarendon. The bar and restaurant closed almost two years ago and auctioned off most of their equipment and decorations. Now it may return, this time closer to the Metro station and a little bit smaller in size. I'm curious as to its physical location. Could Dr. Dremo's occupy one of the new light commercial spots under construction currently at Clarendon Center? 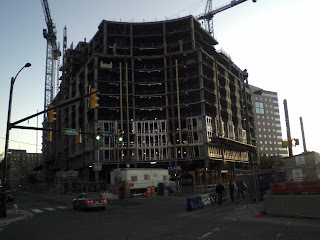 Construction of Clarendon Center is coming along at an impressive rate at the corners of Clarendon Blvd, Highland Street, and Garfield Street. The south project tower's skeleton is completed up to its 12th floor roof, and steel framing of the exterior walls has begun on floors 2 through 4. Also I've noticed some of the exterior details and window trimming have also been installed. Pictured to the right are comparison photos of what the tower looks like now and Saul Centers' rendition of what it will appear when completed. On the north side behind Hard Times, construction completed on the foundation and what appears to be as four stories of underground parking has been framed. 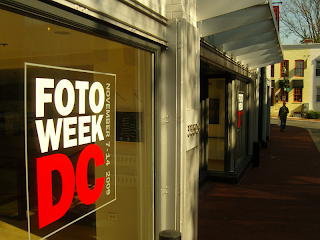 FotoWeek DC is an annual super-sized exhibition taking place at 60 galleries and locales and in the DC Metro area with entries from 3,500 photographers. Started by a non-profit organization last year to "celebrate the power of photography." Georgetown hosts many of the main galleries, one of which being on 3338 M St NW M Street. 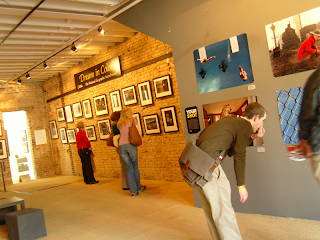 This two story exhibit featured a diverse display of photography. Subjects varied from portions of the DC 12 hour overnight photo competition to scenes from troubled Uganda. The seven day event goes from Nov 7th to next Saturday Nov 14th. All the galleries are free, but you should register online and print out the bar coded ticket beforehand. The festival also has two locations near Clarendon I want to check out soon: one in Courthouse and Rosslyn. Due to word of mouth recommendations and great Yelp reviews, I was inspired to try a new restaurant in DC north of Dupont Circle. 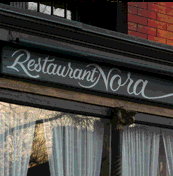 Restaurant Nora is a highly rated, high end, expensive and very impressive dinning experience in Embassy Row. The food at Nora was top notch, and the meals were made more exciting by the fact that the venue is the first certified organic restaurant in the country. The back of the extensive and lavish menu details how the food only comes from animals that were not mistreated or feed steroids. I had the Grilled Grassfed Ribeye Steak which was amazing. The Handmade Potato Gnocchi & Sage Sausage made for a great appetizer. Parking is limited around the area, but easier to get on the weekends due to most street restrictions being Monday thru Friday. Valet parking is also available at the restaurant. Highly recommended for a classy and pricey night out! 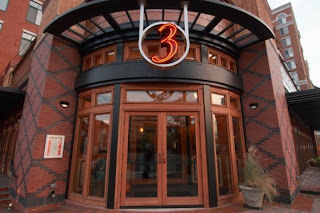 The owners of Whitlow's on Wilson opened up their third restaurant last year, aptly named Restaurant 3. This offers a more upscale restaurant and bar than Whitlow's, but still has an American styled menu. There are some interesting items there, including the Chicken and Waffles dinner entree, of which I had to try out of curiosity. I liked the venue, and would recommend it as a night date dinner place alternative.